So I love reading manga. And traditionally, manga is printed and bound like a book… but in today’s world when iPhone, iPads, Samsung tablets, and what-have-you rule the world, I would like to share with you one of my new favorite ways to read manga: on a tablet. Have you ever seen those annoying advertisements peppering your browser while you read? Yes, you have. And boy are they annoying. Even if you have AdBlock installed, fact is, there is always some annoying navigation up at the top, and even the best of the online readers will usually require you to scroll down to read one full page because manga pages are usually in portrait mode, not landscape. The great thing about a tablet? You can rotate it to suit your needs! A tablet in portrait orientation is just the perfect size for a standard manga page, and a number of apps will allow you to expand the image to fit exactly in the screen with just a double-tap. Beautiful. MangaHere’s mobile version already looking a lot better, even in a browser! Your tablet probably has a browser. And honestly, lots of these websites’ mobile version ain’t half bad. Mangafox, Mangahere, Mangastream, and Mangasaurus all have dedicated mobile websites, to name a few. Simply using the browser and orienting in portrait mode should already improve your user experience by a lot. But if you want it to be even better, try a few of these apps below. Manga Rock is arguably the best overall reader out there right now. It supports both iOS and Android, and it has a huge catalog you can search through which covers most of the major sites out there (Mangahere, Batoto, MangaEden… etc). Plus it has pretty good UI design and general layout which makes it easy and intuitive to use. The only downside is that when you are actually reading, there is a permanent strip of advertisement on the bottom, which makes it slightly less ideal, but nowhere near the bombardment of ads that you will get on an actual computer. 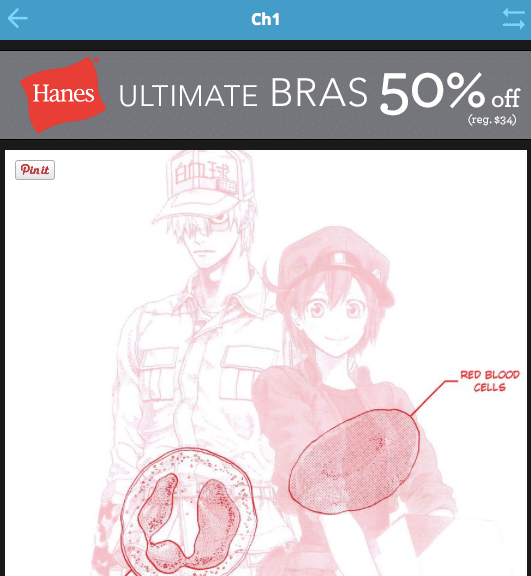 Manga Storm is my personal favorite for iOS, as it doesn’t have the advertisement strip on the bottom. The only catch is that instead of having a large directory for you to search through, you have to manually add the links. You can do through their internal browser by googling the series you want to read, navigating to the browser-based homepage for the reader, and then tapping “+”, which will add the series to your bookshelf. It can take a bit of getting used to how to add new series, but once you do, it works great. A few others that I like include Manga Lib for manga, and Tapastic and LINE Webtoon, which each have their own official apps corresponding to their webtoon websites. I also want to note that while Manga Rock and Manga Lib both offer international support in many different languages, Manga Storm does not appear to. Manga Rock as mentioned above is also going to be one of the frontrunners for Android. I don’t personally have an Android phone, but I have heard good things about Manga Browser as well. And, of course, both the Tapastic and LINE Webtoon apps are available on Android as well for the webtoon lovers. Woohoo! What series would you like me to review next?